I agree... I'm afraid this will be a failure. I'm not quite as skeptical of "architecture" as you... "function" is also part of the aesthetic of the building. If it wasteful and costly, then it's hard to view it as beautiful. As ugly as the old building was, it was useful. Interestingly enough, it was never finished. It appeared structurally sound. You could clearly tell it was meant to have additional floors that were never built. Why not just do that? 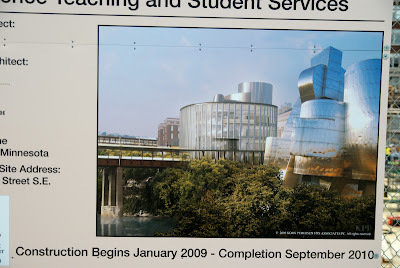 I think the old building was an abomination, but it was functional and there was never any strong argument presented as to why it should be torn down other than that it was "ugly". Ugliness could've been fixed -- slap a new facade on, and finish the building that was mysteriously halted. The new building not only includes less classroom space: it, too, is ugly. Will we be tearing it down in 50 years as well?